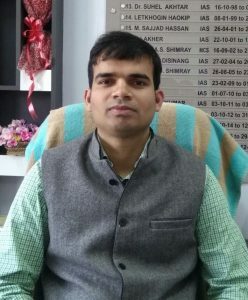 Shri Pawan Yadav, IAS Deputy Commissioner Bishnupur is an officer of the Indian Administrative Service (IAS) belonging to the batch of 2014. He did his B. Tech, Mechanical Engineering from the prestigious Indian Institute of Technology (IIT), Roorkee. He had the experience of working an Assistant Executive Engineer in Oil and Natural Gas Corporation. After joining IAS, he had held charges like OSD Tourism, SDO LM & SDO Chingai and SDO Ukhrul before becoming Deputy Commissioner.